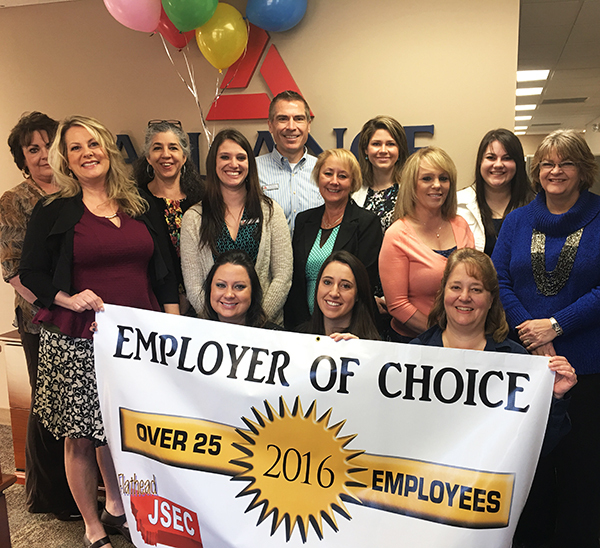 Meet Our Kalispell, Montana Branch – Alliance Title & Escrow Corp.
Posted on April 28, 2016 by Alliance Title & Escrow Corp.
Back row, left to right: Kathy Christopherson, Heidi Escalante, Sarah Tennant, Brandy Woods, Ric Eborall, Debbie Pierce, Samantha Vondrich, Marlene Jones, Carsyn DeReu, and Karen Freeland. Front row, left to right: Jessica Crofts, Amber Cooper and Suzanne Smith. When it comes to premium title and escrow services in Montana, you won’t find a more energetic or qualified group of professionals than at Alliance Title’s Kalispell office. This team works hard to provide superior customer service every day, and they are well-known in the community for being trustworthy and ethical. Many of their employees have over 30 years of experience in the industry. Most of those years were earned at Alliance Title. Each employee in the Kalispell office makes it a priority to be involved in the community they serve. Many of them support local charitable organizations such as Big Brothers Big Sisters of Flathead County. They participate in Relay for Life, Run for Cancer, and the Northwest Montana Fair parade. Every year they hold an annual food drive to collect donations that benefit local food banks. They are also active with the Northwest Montana Association of Realtors, Flathead Building Association, Kalispell Downtown Association, and the local chambers of commerce for Kalispell, Lakeside-Somers, and Whitefish. Home to an estimate 21,518 residents, the City of Kalispell is located in one of the most breathtaking areas of the Big Sky Country. Nestled in the Rocky Mountains, Kalispell is loved by residents and visitors for its mild climate, diverse wildlife, and year-round outdoor recreational activities. The city is surrounded by the Flathead National Forest and is only 15 minutes away from Flathead Lake. Half an hour further away from the city is Glacier National Park. To learn more about Kalispell, click the links below. The Kalispell, Montana branch welcomes the opportunity to provide title and escrow services for your next real estate transaction!